Christmas came early for droves of eager sports writers when hundreds of legal documents pertaining to Tom Brady’s legal battle with the NFL were made public Tuesday night. In addition to the full transcript of Brady’s 11-hour appeal hearing with Roger Goodell, his call logs, and other pieces of evidence, the release includes years of emails Brady’s team turned over at investigators’ requests. The emails don’t contain a smoking gun that would suggest Brady was complicit in deflating footballs, but they do provide a look at the personal email life of the star QB. We combed through the emails – all one-thousand, four-hundred and eight pages of them – for the best stuff. Here’s what we found. Many of the highlights come from exchanges between Brady and friend Jay Flannelly, aka “Beav,’’ an avid Boston sports fan he apparently knows from his days at the University of Michigan way back in the 90s. Brady is apparently friends with Vancouver Canucks owner Francesco Aquilini, who asked the Patriots quarterback would be willing to share his body care secrets with the team at a private meeting at the Four Seasons in Boston. There’s no explicit confirmation the meeting took place, but the emails peg it to Feb. 23. The following day, the Canucks beat the Bruins 2-1. Coincidence? Maybe. In addition to his on-field exploits, Brady also runs the TB12 Sports Therapy Center at Patriot Place, through which he shares his personal training method with athletes. And while he may be a multi-millionaire, that doesn’t mean he gets everything he wants. Case in point: He’s struggled to get the owner of the URL tb12.com to sell the name, with one advisor suggesting they have an intern pose as a student to gain access. 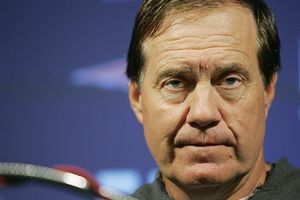 It’s unclear whether they used the ploy (although another advisor later endorsed the idea), but tb12.com is a dead link. Meanwhile, the URL for Brady’s center is tb12nutrition.com. Of all the responses to Deflategate, none have been quite as dramatic as that of Mark Brunell, who nearly cried on-air while discussing Brady’s press conference denials the week the news broke. Apparently, Brady didn’t think too much of the former Jaguar’s theatrics. Another one to file under Tom Brady Doesn’t Always Get What He Wants: when Brady was pool cover-shopping last October, he asked manager Ben Rawitz to get a white one. Simple enough, right? Not so fast: The company didn’t offer white covers, which led to the scathing response above. But Brady did not berate the poor pool supplier any further: Cooler heads prevailed, and wife Gisele Bundchen decided on gray. Not only do Rawitz’s duties include ordering pool covers, they apparently include printing out game plans and delivering them to Brady’s Back Bay condo. Sure, you can simply chalk this up to its face value and assume Brady didn’t have Microsoft Excel on the computer he was using at the time, or you can accept the obvious: gridiron gods don’t have time to deal with productivity software. Of the recipient or sender names not redacted in the released emails, just one isn’t a first and last name: Lovvvey Lovvvey. The logical conclusion would be that this is a pet name for Gisele Bundchen, but the dump includes other emails seemingly to her at a different address, and the above example is Brady forwarding part of the Patriots’ game plan against the Chicago Bears. Our guess/hope for Lovvvey Lovvvey’s identity? This guy.